I’m a sucker for pub quizzes, but I can’t help feeling that over that last decade with the introduction of smartphones that some of the old innocence and gamesmanship has been lost a little bit. Anyone can simply nip to the toilet mid-round and look up an answer that they were stumped on – It’s not in anyway sporting, but sometimes that $50 bar tab can sound just too sweet to pass up (not to me, obviously. But to others… I’ll bet). But before your mistrust of the public gets out of hand, there’s a way to both satisfy your quiz cravings whilst also embracing smartphone technology from the comfort of your own home. 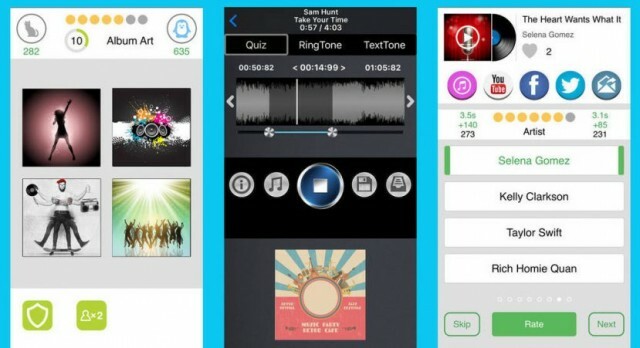 SongBand is a new music quiz app from Kikiwa that lets you verse friends and strangers in a musical battle-of-the-wits. You can pick from a range of different rounds like speed matches, picture and item battles and single play. Each round is five questions long and vary in themes, that the gamer chooses beforehand, from; ‘80s, ‘90s, hits from 2014 and love songs. There are three other themes available that can be unlocked for 30 ‘coins’ which include hits from 2015, Dance songs and movie soundtracks. The apps interface is simple and easy to use whilst the bright and colourful graphics make it fun to navigate. You can verse friends, random players from around the world or simply play against yourself. Each round you compete earns you points and at the end of each quiz the app asks you to rate it so as to filter out any bad or boring questions for future players. Gamers are also able to curate their own quizzes which circle into the the app’s archive for other players to try their hand at. The app is free to download from the App Store but it does come with the inevitable ads that punctuate game play. It’s compatible on iPhone and iPad and is available in English, Japanese, Chinese and Korean. SongBand is fun to play, a little addictive and will always keep you entertained and on your toes. If you want to have a crack at musical knowledge mastery then two-step over to the App Store and download SongBand today!